The TMP feature set is enabled by default. If you wish to disable it, or to enable it after it has been disabled, perform the procedure in this section. Note - TPM enables you to administer the TPM security hardware in your server. For additional information about implementing this feature, refer to the Windows Trusted Platform Module Management documentation provided by your operating system or third-party software vendor. 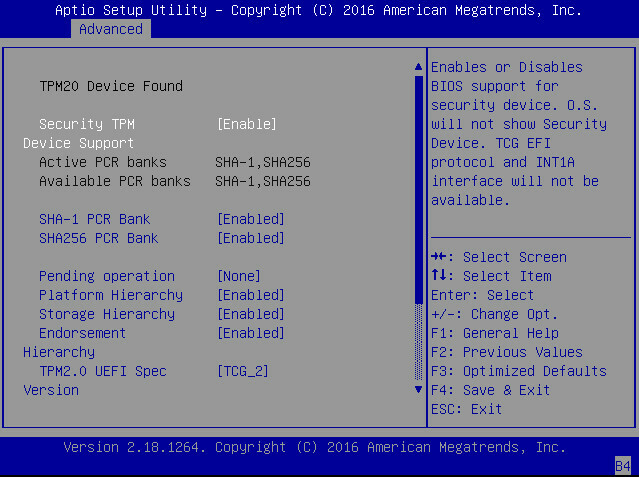 In the BIOS Setup Utility menus, navigate to the Advanced Menu. On the Advanced Menu screen, select Trusted Computing 2.0. Select Disable to disable Security TPM Device Support. Select Enable to enable Security TPM Device Support. On the updated Trusted Computing 2.0 Configuration screen, press the F10 key to save the changes and exit the BIOS Setup Utility.